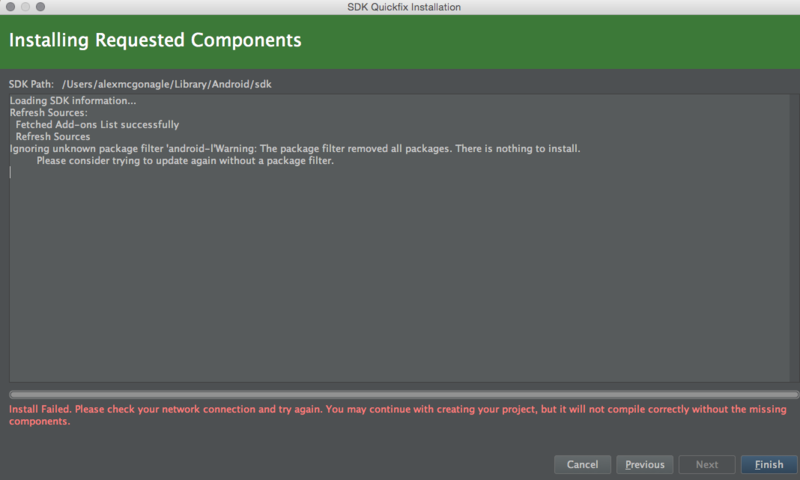 The project you imported from eclipse is probably using an older version of the android SDK. Check the API version in the project. Typically, clicking the "Install missing platform(s) and sync project" works but seems like Android Studio isn't able to connect to the internet. There are some security restrictions that Mac OS X places on any application trying to connect to the internet, especially when you've edited the Info.plist file, which is not recommended. Did you get a dialog asking your to allow java to make network connections? Perhaps you clicked No? I had the exact same problem on Mac OS X. Here is how I fixed it. It will start the update of package in non-gui mode and ask for permission etc. and finally install well. I was in the same mess while compiling AOSP app (e.g. Calculator) on my Android studio There is lot of help on this, but bit scattered probably because of different versions for same issue. Below is my changes if some one find it useful. I do not claim its a 100% solution for this issue but gives you an direction to the area of concern. load your build.grade file into studio and do following modifications. take a look at my comments against the original changed values. NOTE: You can play with different values based on your requirements. compileSdkVersion 21   // Remove the "Android-L"
Not the answer you're looking for? Browse other questions tagged android android-studio android-5.0-lollipop or ask your own question.